I worked for 18 years of my life, as a social worker and social work manager, in the field of children and families. 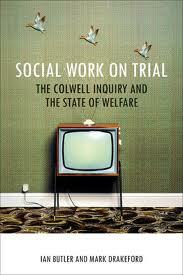 I now work part-time as a lecturer in social work. In the course of my work I recently came across this interesting book, by Mark Drakeford and Ian Butler, which looks at the Maria Colwell child abuse inquiry and its legacy. I guess this, to most people, will seem a topic of rather specialist interest, but it occurs to me that it is, or ought to be, of more general concern. Maria Colwell died in Brighton in 1973, at the age of 7, as a result of physical abuse by her stepfather, Mr Kepple. Social workers had placed Maria in the care of her mother and stepfather after she had been fostered for several years by an aunt. When Maria died, two social workers from two different agencies had been visiting the family, as had an Education Welfare Officer, and concerns had been expressed for some time about Maria’s care by neighbours and others. Why had she been returned home? Why had warning signs not been acted on? The Inquiry resulted in the child protection system which still, broadly speaking, continues to exist, but it also laid down the pattern for a succession of similar public inquiries that were to follow, at regular intervals, up to the present time, Victoria Climbié and Peter Connelly (Baby P) being famous and relatively recent examples. They have become an odd kind of ritual (whose atavistic nature I tried to capture in my story ‘Johnny’s New Job’). Public acts of contrition are performed. New procedures and guidelines are introduced. Individuals are named, sacked and subjected to media lynching. Curiously – and I tried to capture this in Johnny’s New Job – public interest in these occasional high-profile scandals is not matched by an interest in the roughly 2 children a week who die in the UK as a result of maltreatment by their carers, or interest in the social conditions in which abuse and neglect tends to occur (for child abusers, believe or not, do not just spring spontaneously into being). Today in the Daily Mail we reveal the profoundly disturbing details of how decent people can be caught up in a nightmare they don’t understand, how happy, cared-for children can be torn from their mothers and given to strangers and how a remorseless administrative machine insists it’s all for the best. Of course it is entirely possible to err in both directions, and I’ve no doubt that this occurs, but the fact remains that, if children are not to be removed from their parents at the first whiff of the possibility of their coming to harm, this means leaving children with parents in situations which might turn out to be harmful. Wherever the threshold is drawn for draconian interventions, there will be false positives and false negatives. Failure to accept this can lead to a system that becomes preoccupied with the pursuit of information, of unattainable certainty, at the expense of its wider brief of providing help and support. But again, these more nuanced arguments are of very little general interest, as compared to the interest that is aroused by the great set piece of the ‘child abuse scandal’, the calls for sackings and so on. There’s something much more primitive going on here than the rational activity of trying to understand why a tragedy has occurred. As is often the case, a great SF writer has something to say on all this. Ursula Le Guin, in her superlative story ‘The Ones who Walk Away from Omelas’ (along with her ‘Semley’s Necklace’ it is one of the best short stories I have ever read), spends most of the word-count conjuring up a utopian society called Omelas, full of pleasures and delights of every kind. Only towards the end, do we learn that the price to be paid for all of this is paid by a single wretched child, held captive and abused in a squalid cellar. Unfortunately, the real world is like this. Those of us who live secure and comfortable lives, must do so in the knowledge that, hidden away from us, but probably not far away, are others, children, who cannot conceivably be to blame for the situations they find themselves in, living with violence and hatred and horror. If we are to enjoy our pleasures, our meals in restaurants, our holidays, our interesting jobs, then we have to find a way of doing this in the knowledge of these others who are, figuratively if not literally, imprisoned in their cellars nearby. We want to put them out of our mind, but, more than that, we want to feel justified in doing so, and one excellent way of achieving this is by telling ourselves that something ought to be done about those children, but it is someone else’s job . That way, if we find ourselves confronted with direct evidence of those children down in their cellars, we are released from guilt, and can feel instead a righteous and indignant rage. This isn’t to say that professionals involved in these scandals are necessarily blameless, but only to point out that by heaping blame on them, we don’t magically exonerate ourselves.